These elections are a big triumph for the workers’ movement and the masses of Spain. They crown a whole stage of struggles, workers’ interventions and social movements opposed to the policies of austerity. Opposed also to the restrictions imposed by the European Union and slapped on the country by the government of the Popular Party (PP). Every organization and social sector mobilised to fight the effects of a crisis started by the bank and high finance. As tidal waves of citizens sapped at the PP’s base of support, they prepared the political leap signified in this electoral consultation. The constant mobilisations and struggles throughout the electoral process had their effects on the campaign. In Madrid, the Coca Cola workers won after a year on strike. They camped at the company’s door until it reopened, and until the sacked workers were taken back. 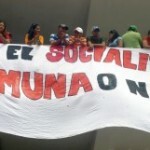 The strike at MoviStar (a huge telephony contractor and sub-contractor) against conditions of semi-slavery had great repercussions, as it received the support and solidarity of the campaign’s candidates and left-wing parties. Invited to intervene in all the public meetings, these played a decisive role. The struggle at MoviStar expressed itself in these elections, and defeated attempts on the part of the large Trade Unions and bosses to break the workers’ Front with combative Unions and the population. The MoviStar strike ended with the occupation of one of the Telephony towers in Barcelona, where delegations of social movements and left-wing parties supported throughout. It is there, in front of an emotional crowd, that Ada Colau celebrated having been chosen as candidate for Mayor of Barcelona. She said that she would mediate in the workers’ conflict. And should she become Mayor, she would break relations with companies that trample upon Trade Unions rights and demands. MoviStar eventually reopened negotiations, but there was little to compare the final results with the magnitude of the struggle. In the Municipal elections of the large capitals like Madrid, Barcelona, Valencia and Zaragoza, slates of left coalitions were created to stand councillors. This allowed the population to express its rejection of the PP’s cuts that hit hard at the working class and the most vulnerable, increasing poverty and worsening the conditions of life. The PP lost in the four major capitals, as well as in Santiago de Compostela, La Coruna, Cadiz, Ferrol, Sevilla and many other towns. This reflects the advance of the organisations of the left. There is a craving for new ways to do politics, democratize the institutions and make them serve the population. This was a big blow at the policy of the right wing which lost 30% of its vote (nationally). In the Regional elections, Podemos stood on lists of its own and won between 8 and 20% of the vote, whilst in the most important capitals and cities, it presented itself in coalition with social movements and some left forces. Because this lowered the programmatic level compared with the European elections, the electoral result was less great than anticipated. Nevertheless, Podemos now plays a very important role in the Regional Governments of Aragon and Valencia. In the Comunidad de Madrid the right wing PP gained 21 seats in the 24 May municipal elections. This meant that it lost its majority, whilst remaining able to form a government with the ‘Ciudadanos’ vote – a centre-right Party of PP’s origins. However, the Ahora Madrid slate led by Manuela Carmena, by winning 20 seats, made an unexpectedly breakthrough that deals a powerful blow at the PP’s ultra-right. Manuela Carmena canvassing for the popular slate Ahora Madrid. It very nearly won. Manuela Carmena became Madrid’s Mayor [through an agreement she made with the PSOE]. She is a former high judge and ex-Communist Party member. In her new capacity, she presented an anti-crisis programme to be financed by 79 million Euros from the city’s coffers, to assist the 104,000 persons in social exclusion. The education centres will receive larger food grants for children in desperate need, and meals will be provided to all children during holidays. In Manuela Carmena’s view, energy and water are goods of first necessity. She wants universal health cover for all, and especially for the undocumented immigrants presently excluded. She plans to set up an office for mortgage mediation, to stop evictions and enlarge the housing stock. She will address the banks to restructure the municipal debt and lower interests on debt repayments. 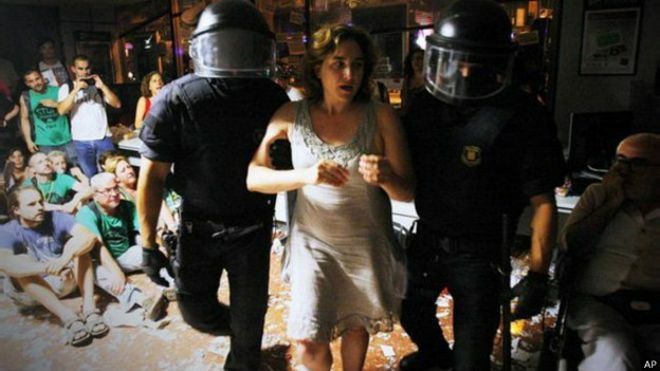 Adau Colau, the one arrested for resisting an eviction, is now in charge of the municipal police. 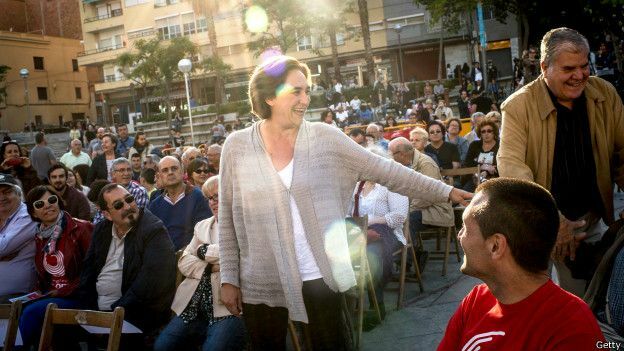 The phenomenon that brings Ada Colau to the fore deserves an explanation, along with the electoral assembly list Barcelona en Comú, which she leads. She comes from the Occupy movement and the fight for homes. She has been instrumental in the PAH, a platform that stopped many evictions and spreads its organization throughout Spain. She was at the head of social movements when she decided to enter politics. There, she created an electoral slate comprised of Podemos, Izquierda Unida, rank-and-file trade unionists and other left organisations. 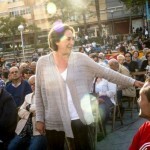 She proceeded to visit every borough in Barcelona, the most popular ones above all, holding public meetings and rallies with a large participation of women and youths. These emotionally charged occasions were founts of optimism and hope. The nationalist Party ‘Convergencia I Unio’ expected to retain its position of Council leading group, but the vote of the working class in the suburbs allowed Barcelona en Comú to win instead – with Ada Colau at the head. Her accession to the post of Mayor, like that of other Mayors, drew veritable fiestas of acclamation to all the places where swearing-in ceremonies were held. The most interesting measures announced on behalf of Barcelona’s advancement are as follows: right to a roof, sustainable tourism respectful of the population, struggle against unemployment and poverty, stimulation of cooperatives, universal and free public education up to the age of 3, lower transport costs, free transport for the under 16, lower rents, and rent reductions for the unemployed. Although the right-wing PP won fewer votes nationally, it still won the most votes. It uses this argument to console itself for the loss of its absolute majority in important regions and in the major towns. For the PP lost 2.5 million votes, a very serious defeat for the bourgeoisie. The Socialist Party lost 700,000 votes. It campaigned with fewer forces than at the time when ‘democracy’ was installed in Spain, but its results were still improved in communities and large towns where it had electoral pacts with left forces, like Podemos. 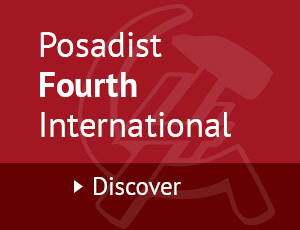 Before and during the campaign, the debates stimulated a sector of the Socialist Party to distance itself from the socialist apparatus and seek alliances with left organisations and social movements. ‘Izquierda Unida’ suffered the greatest electoral reverse of its history. It is practically left out of the institutions in most regions, although it keeps its same councillors and mayors in smaller places. Its leadership has proven incapable of making a balance, or of drawing conclusions from its part in corruption, in Madrid above all. The great fragmentation of the left drove it to electoral engineering methods in order to govern, as in the big towns. These elections open a window on the November general elections. They also feed the conclusion that, in spite of this big advance of the left, no programme is on offer for social transformation: Nationalisation and debt-restructuring will demand a political centre speaking for those aims, and ready to lead the process of change. Still, these elections have highlighted the dual power that exists in society. For this to deepen, a more decisive participation of the workers movement is required. A class leadership is needed, with class leaders, along with a Front of social movements, left parties and the whole of society. Madrid is one of the 7 autonomous communities of Spain. Assembly of the autonomous community of Madrid – run by 57 City Councillors and a Mayor. ‘Ahora Madrid’ regroups political parties and social movements like Podemos, the Communist Party Madrid, Neighbourhood organisations, various Greens, Youth organisations and a branch of Izquierda Unida. On 30 March, a primary of ‘Ahora’ selected Manuela Carmena as its candidate for Mayor. Izquierda Unida (IU), political and social movement started in 1986 “for democratic socialism”, composed of organisations like the Communist Party of Spain, Izquierda Republicana and Eco-socialists. IU is member of the PIE and the GUE-NGL in the European Parliament. Cayo Lara is the present leader. The process between the end of Franco and the start of ‘democracy’ was an extended one in the 1970’s.